Recently released data from the U.S. Bureau of Labor Statistics illuminates which large metros have the fastest growing private sector. Growth is measured by the percentage change in private sector employment between Dec. 2014 and Dec. 2015. Headlight Data ranks private sector employment growth for the 53 largest metros (1,000,000+ people) in the U.S. In 2015, U.S. private sector employment grew 2.3%. Among large metros, the highest growth is found in Austin (5.5%). Orlando (5.0%), Richmond (5.0%) and San Jose (4.7%) follow. 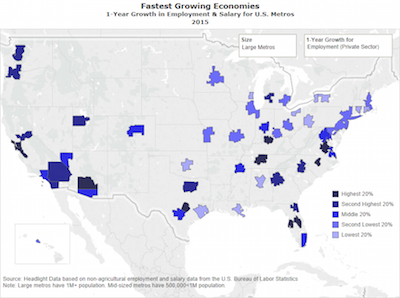 Other large metros with rapidly growing economies are Raleigh, San Francisco, and Phoenix. Rochester (-0.7%), Buffalo (-0.4%), and Oklahoma City (-0.3%) ranked lowest for growth. Since 2010, the U.S. private sector growth rate has increased 1.2 percentage points. The large metros showing the most improvement (with the greatest increase in the annual growth rate) are Sacramento (+4.2 pts. ), Richmond (+4.2 pts.) and Las Vegas (+3.8 pts.). San Francisco, Orlando and Phoenix also experienced a substantial improvement. Fifteen large metros have slowed since 2010. The large metros with the largest declines in growth rate are Oklahoma City (3.5 pt. decrease), Houston (-2.0 pts.) and Pittsburgh (-1.9 pts.). 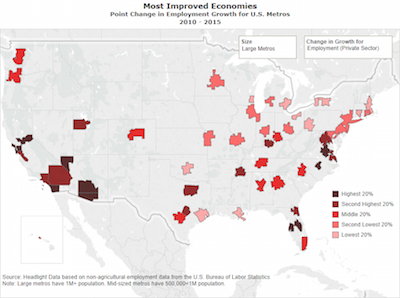 Other metros with a declining growth rate since 2010 are New Orleans, Rochester and Buffalo.